The Janine table encompasses a sleek glass table top within a timeless aluminium frame. Janine will bring a modern touch to your outdoor space, providing an extendable solution for any occasion which makes it the perfect table for your garden, patio or decking. 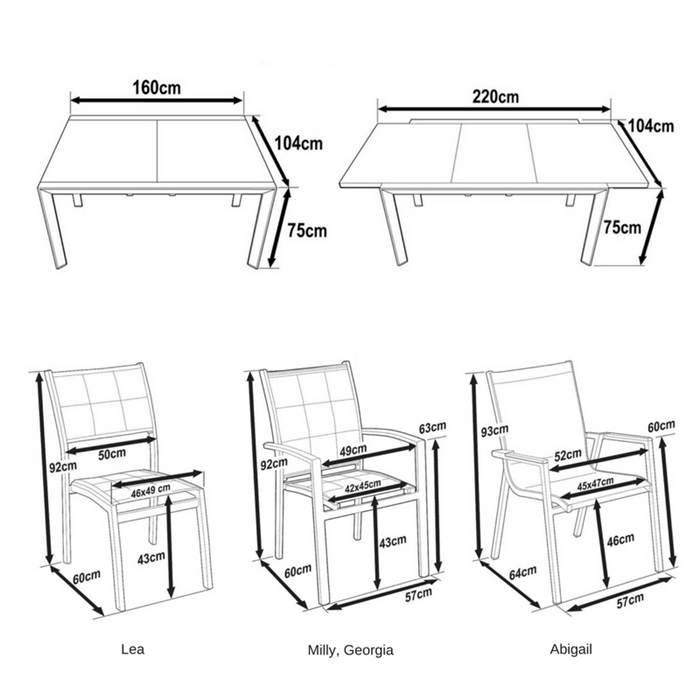 The Janine model is also a lightweight table weighing only 39kg which makes moving it around your garden a hassle-free task. To match the table, choose 6 stacking chairs from the options available. The chairs have aluminium frames that are light and strong and are fitted with an outdoor mesh fabric that is sturdy and comfortable. 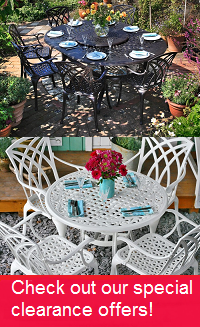 As its name implies, the Janine table & 6 chair set in White & Champagne will add a touch of luxury to any garden or home. We also offer the Janine in deep Black, smooth Grey or cool White & Grey. Don't forget to look at our gifts section above where we offer amazing discounts of 30-70% on a wide range of products to complement your purchase of the Janine table set. Marvellous product. Very practical, very good looking , very well thought out and designed. Table is the right width and the legs on each corner mean the chairs tuck under neatly. Heavy enough not to get blown over by the wind and the chairs nice and light, comfortable and stackable. We got the most expensive of the 3 choices of chair , for the breathable, weather proof fabric... the delivery time was really bad tho.. waited in for 3 days as the delivery company kept cancelling.